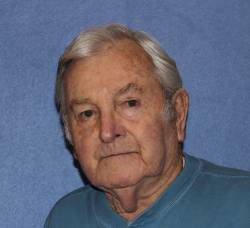 Fairfield – Carlton Leon Graves a lifelong Franklin County resident passed away, Tuesday, June 27th, 2017, at the Franklin County Rehab Center surrounded by his family. Born on May 15th, 1930, in St. Albans Town, he was the son of the late Guy and Louise (Gould) Graves. Carlton was 87 years old. On September 2nd, 1950, he married Joyce Underwood at her parent’s farm on the Bushey Road. Joyce and Carlton were married for 66 ½ years. Carlton was a 1948 graduate of Bellows Free Academy and served in the Vermont National Guard. For many years he operated his own dairy farm while employed by the Central Vermont Railway. He started his 39-year railroad career in 1952 as a fireman on steam engines and retired as an engineer on Amtrak. He was a 50-year member of the Local United Transportation Union where he held the position of General Chairman for many years. Carlton was a member of the First Baptist Church of St. Albans for 66 years, where he served on the Board of Deacons and as Chairman of the Board of Trustees for many years. He was also a member of the Fairfield Historical Society and served as a Lister and Tax Collector for the Town of Fairfield for several years. He was known for his collection of antique tractors, which he spent many enjoyable hours restoring and was always excited to talk about their history. Survivors include his wife, Joyce, of Fairfield; their children, Leon Graves and his wife, Amy, of Marcellus, New York, Lisa Griswold and her husband, Kerry, of Fairfax, Reverend Larry Graves and his wife, Kathy, of West Des Moines, Iowa and Jeffrey Graves and his wife, Carla, of Durant, Iowa, as well as ten grandchildren and thirteen great-grandchildren. He is also survived by his brother, Alvin Graves of Florida and many nieces and nephews. In addition to his parents, Carlton was pre-deceased by his sons, Stephen and David and by one brother and three sisters. Carlton’s family will receive family and friends on Friday, June 30th, 2017, from 4:00 to 7:00 PM at the Heald Funeral Home, 87 South Main Street, St. Albans. A funeral service will be held on Saturday, July 1st, 2017, at 1:00 PM at the First Baptist Church of St. Albans, 29 Congress Street, St. Albans. Pastor William Simmons will officiate. Interment will follow in the family lot in the St. Albans Bay Cemetery. You are invited to join friends and family for a reception at the St. Paul’s United Methodist Church on Church Street, St. Albans. In lieu of flowers, those planning an expression of sympathy are asked to consider the Franklin County Home Health Agency, 3 Home Health Circle, St. Albans, VT 05478 or the First Baptist Church of St. Albans, 29 Congress Street, St. Albans, VT 05478. To send Carlton’s family a written expression of sympathy or share a memory, please go to his on-line guest book at www.healdfuneralhome.com.